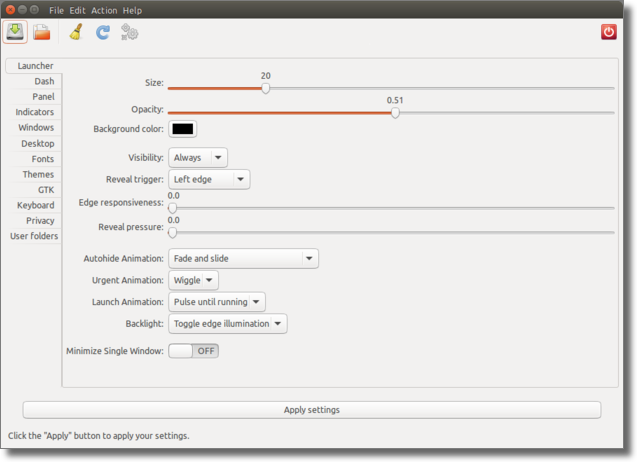 You can use Unsettings to change the themes for GTK, window manager, icons and cursors. But it doesn’t support the installation of new themes. As far as I know there aren’t any critical bugs in Unsettings. If you find a bug in Unsettings have have an idea how Unsettings could be improved please report it at the bugtracker at Launchpad so that I can have a look at it. Thank you. Unsettings is being developed and tested on Ubuntu 15.10 “Wily Werewolf” and additionally tested on Ubuntu 12.04 “Precise Pangolin”, Ubuntu 14.04 “Trusty Tahr” and Ubuntu 15.04 “Vivid Vervet”. Versions older than Ubuntu 14.04 “Trusty Tahr” are not supported. All software packages needed by Unsettings are installed by default on Ubuntu. Have a look at the project page at Launchpad , too. If you want to help to translate Unsettings to other languages go to the translation page at Launchpad. To see the list of people who contributed to the translatiosn you are using go to Help –> About –> Credits in Unsettings. Thanks to all contributors! You really rock! You can use Unsettings under the conditions of GPL v3 or later. If you add this PPA to your software sources Ubuntu’s Update manager will automatically install newer versions of Unsettings, when they are available. If you don’t know how to do this see this explanation. Depending on how busy the Launchpad build servers are it may take a few hours for the PPA to get new packages after a release.